Our listeners may, or may not, know that Apple FM is solely run by volunteers and to keep the station on-air we rely on our advertisers, sponsors and on fundraising campaigns. 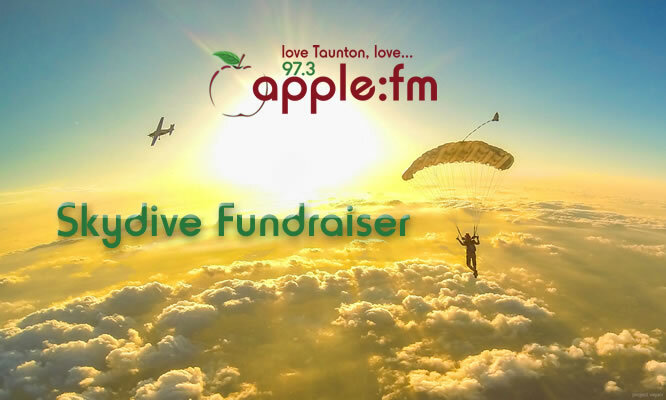 Apple FM’s James Hodges is currently fundraising by doing a 15,000 ft Skydive. He takes to the skies, and returns back to earth, on Saturday 25th August. Please give what you can, however big or small by following the details below. James will be jumping with SkyDive Buzz at Dunkeswell in Devon, He will receive a small amount of training on the day then climb aboard the plane and climb to 15,000 where he will jump (attached to a professional) and free fall for a whole minute before the chute opens. From there he will then descend the remainder with a parachute. James also informs us that he has only been on a plane four times and most definitely hasn’t fallen out of one. or visit his JustGiving page here.